← Wood Becomes Paper Right? or Vice Versa? If orange is the new pink in the world of design, and Scarlet Opus Lead Trend Forecaster Victoria Redshaw assures us that it is, then in the world of wood flooring the new color is grey. 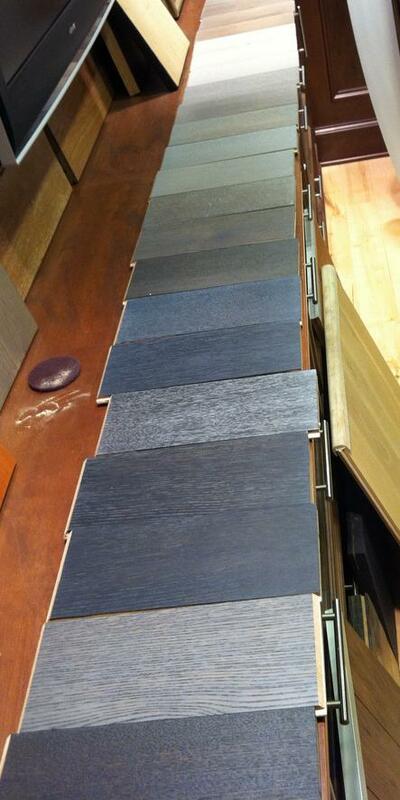 Manufacturers from Du Chateau to WD Flooring to Real Wood Floors are rolling out whole product lines in shades of grey. Inspired by a trip to Alaska, the design team from WD created these grey toned floors. Design blogger Kathryn Vercillo points out that while grey is traditionally perceived to be a formal color, when used judiciously it can convey a sense of old-time elegance and warmth. Grey, because of its neutrality, can be mixed with a variety of colors, and pairs up well even with other neutrals like white and black. Grey floors, until now often confined to the kitchen or other areas where a clean, and even sterile look were desired, are now expanding into the living room and bedroom. Grey floors have found a receptive market in Europe for at least a year. On this side of the water, the trend seems to be gaining traction primarily on the coasts, look for it to make its way into the heartland in the near future. The quality of writing has really gone up in this latest post! Nice job, Sammy! What is the best way to achieve the look. Do you add ebony to a natural stain? We have white oak floors. There are a few different tricks Alicia. Call me if you want to discuss. Thanks for posting!